Prescott is home to the historical area known as "Whiskey Row", until 1956 a notorious red-light district. In 1900, a great fire destroyed most of the buildings on Whiskey Row. As legend has it, the patrons of the various bars simply took their drinks across the street to the Courthouse square and watched it burn. At the time of the fire, the entire bar and back-bar of the Palace Hotel was removed to the square by the patrons as the fire approached, re-installing it after the gutted brick structure was rebuilt. (The size of the back-bar is impressive, and appears not easily moved, even by many hands.) Whiskey Row runs north and south on S. Montezuma St. between Gurley and Goodwin St., directly west of the county courthouse. The most disastrous fire in the history of the town started at 10:45 p.m. in a row of wooden buildings know as the Scopel block on South Montezuma street, and at this hour, 12:30 a.m. (Sunday), every building on the west side of the plaza as far north as Guerley street, including the Hotel Burke is destroyed. The fire is still spreading and there is no telling where it will stop. The principal business houses so far burned are those of Sam Hill, D. Levy & Co. and Ed Block. Every building between Montezuma and Granite street is gone. The Courier office is totally destroyed and the Journal Miner office is in great danger. The firemen are perfectly helpless, as there is no water. Business houses on the north side of the plaza are moving out their goods. Over a dozen stores were blown up without effect. It now looks as if the entire north part of the town would go. 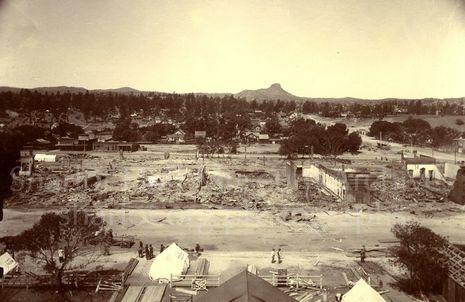 On Saturday night, July 14, 1900, fire swept through downtown Prescott with an uncontrollable fury, almost totally destroying the business district of the small mining town. Starting in the O.K. 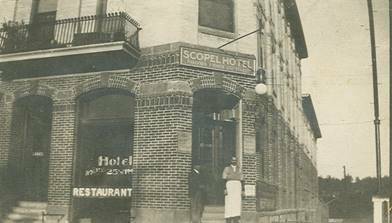 Lodging House, next door to the south of the newly built Scopel Hotel on South Montezuma at Goodwin, possibly when a miner left a lighted candle stuck in the wall of his room, the fire quickly spread to the Scopel. At this point the fire could have been easily stopped with a few buckets of water...but Prescott had no water! The water supply at that time was from a well on Aubrey Street, about a block south, but the pumping plant was being overhauled and repaired, with the engine disconnected from the pump. A scene of the greatest desolations and a feeling of deepest gloom pervades this town today. All that remains of the principal business portion of the town is tottering walls and piles of charred and burning debris. The fire which started at 10:45 last night was not under control until 3 o'clock this morning, when the fire fighters went a distance in advance of the flames and blew up the buildings on the south side of Goodwin street, preventing them from crossing that street. The most conservative estimate of the total losses are from $1,000,000 to $1,500,000. The burned district embraces five blocks, in which were located the principal business houses, both banks, both telegraph offices, three newspaper offices, four hotels and every saloon and every restaurant except one in the town, besides scores of private residences. To add to the prevailing gloom a high wind has prevailed all day, sending smoke, dust and burning embers in every direction, requiring the greatest vigilance to prevent another outbreak of the flames. Owing to the chaotic conditions prevailing to-day [sic], it is impossible to obtain an accurate account of the loss or individual insurance.